On February 9th, 2014, the village of Maan in Hama province is overrun by forces identified by video evidence as mostly Islamic Front, with flags and emblems of their subgroups Ahrar- and Suqour Al-Sham visible, in addition to Al-Qaeda affiliate Al Nusra Front. Government and associated sources speak of a massacre killing several dozens of civilians, while sources friendly to the aggressors initially speak about around two dozens deaths of pro-government militia men, but later acknowledge that a number of civilians were killed. Maan is close to the main highway connecting Aleppo with Damascus and was the site of a prior, and rather murky, massacre on Christmas Day, 2012. Ma'an (Arabic: معان - translates "gloss" or "glitter") is located here on Google maps, and on Wikimapia, 22 km north of Hama. It seems to be a small town of only a few thousand people, but not a village, set amid expansive fields. It's about three miles east of Morek, which straddles the main north-south highway connecting Damascus and Aleppo and thus is seen as important enough for rebels to attack over and over. Maan as well absorbs part of these frequent attacks. As reported, its people are mainly Alawi Muslim, the same religion as president Assad, although some reports and its moderate size suggest a mix, with a Sunni minority. The 2014 incident features more video from the scene allowing a clearer verification. 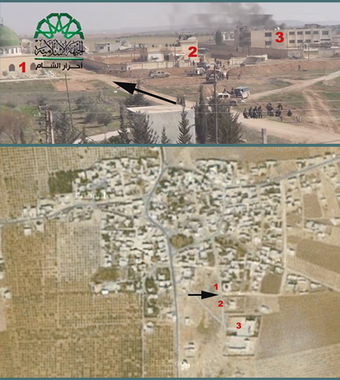 One useful video of February 9, stamped with the Islamic Front's logo, shows part of the town from a high vantage point. The scene of a mosque and two walled compounds and unique crossing roads, looking east, can be matched to the labeled spot in the south of town. There may be a slender tower visible about where the video is shot from (not labeled - a thin line pointing to about 4:15 on the clock). First we heard ‘Allah Akbar’, they kept shouting it for an hour while we held hunting rifles, others held military ones. We took refuge in our homes. The shouting was accompanied with shelling. Our home was opposite to the eastern area, so we were hit with mortar shells, parts of the house collapsed and rubble came flying towards us. Some of the attackers wore a costume similar to the Afghanis’, their dialect was not similar to the local one. They entered the house of my uncle, he was 80 years old, they climbed to the roof and used it to launch shells on the town. This page was last edited on 2 August 2015, at 01:11.